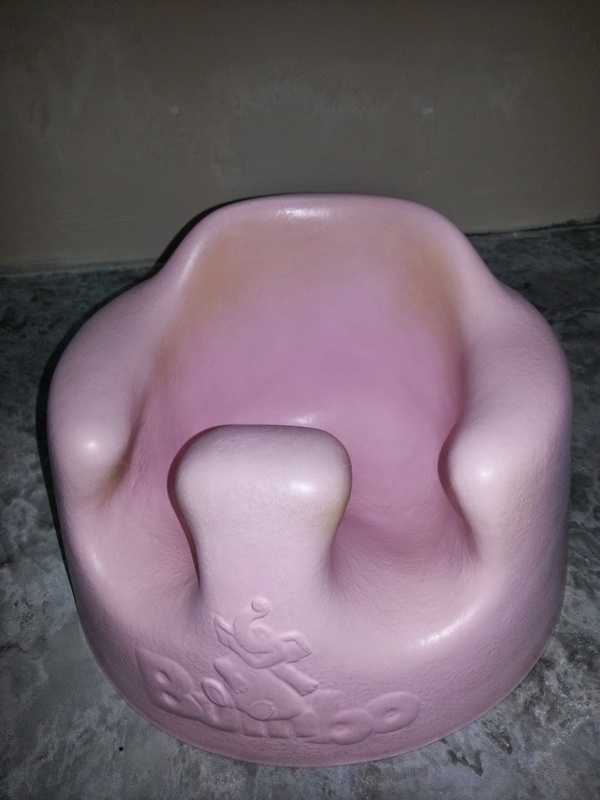 The Bumbo Baby Seat is a snug and cozy environment for your baby. 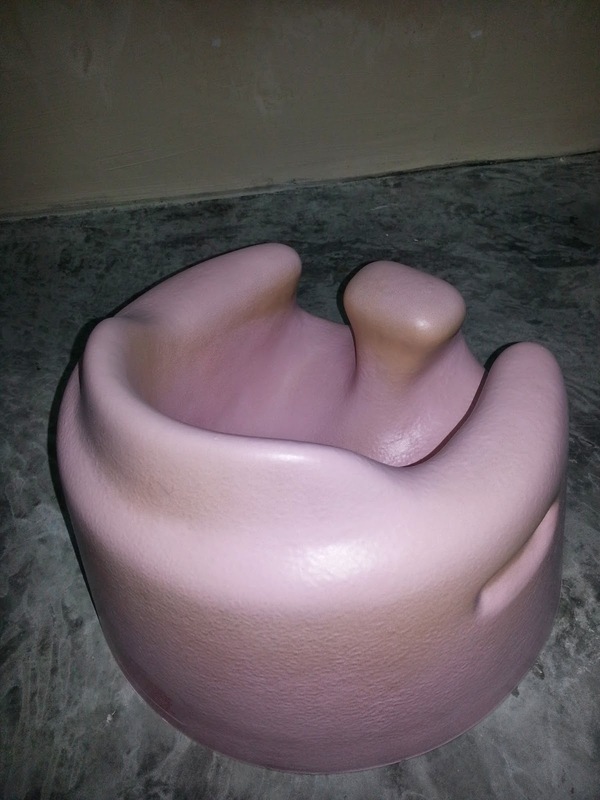 This revolutionary infant chair is uniquely designed according to the baby's posture. The Bumbo enables babies to sit upright all by themselves! Bumbo Baby Seats are suitable for babies from as young as six weeks (or as soon as they can support their own heads unaided) to an age of approximately fourteen months. This award winning infant chair is manufactured to the highest safety standards from low-density foam material, which makes it lightweight and portable. 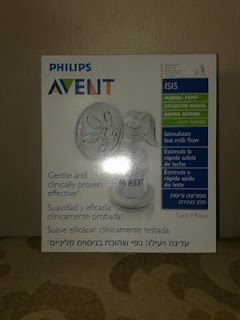 It is soft and comfortable for the baby, safe, hygienic and nontoxic. The integral outer skin of the material is durable and easy to clean. The Bumbo Baby Seat is versatile and can be used safely and conveniently anywhere on any level surface, and is definitely the extra set of hands you have always been looking for? 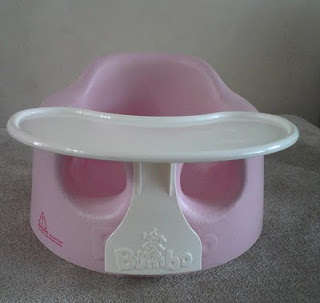 The Bumbo does not require any uncomfortable straps or fasteners. 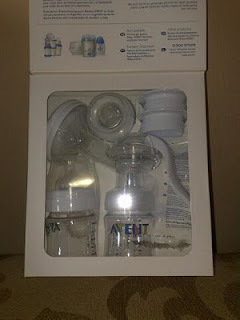 It is designed so that the baby's own body weight keeps baby in place and gives a wonderfully new way to ensure maximum interaction and enjoyable communication with your child. For the sitting baby, the cheetah character holds up a clear drum for baby to bat at -butterflys on it go & round. As the drum rolls, lively music plays as 2 jingle balls rumble around inside encouraging baby to continue playing. The Cheetah swings forward & back in this mode, appearing to chase the drum across the floor. The Ocean Wonders Kick and Crawl Aquarium is a soft gym that features a toy bar on each end and three modes of use: lay at, tummy time and crawl through. Using the detachable hanging toys and mirror, this gym helps develop your baby's arms and legs while stimulating his senses. There's also three "bat-at" toys hanging from the front of the gym, including a fish with spinner, a fish with music and a shell with mirror. At the back of the gym, a soft inflatable "beach ball" with a jingling ball inside hangs for baby to kick at. The gym's soft quilt features a conversion feature with attachment points so toys can be rearranged for laying and tummy-time play. When baby begins to crawl, the gym converts to a crawl-through play space. In crawl-through mode, your infant can play peek-a-boo through the soft mesh sides and parents can attach more toys for added fun. 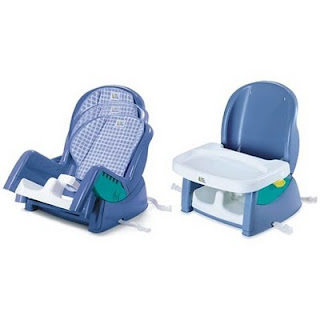 This award winning infant chairis manufactured to the highest safety standards from low-density foam material, which makes it lightweight and portable. It is soft and comfortable for the baby, safe, hygienic and nontoxic. 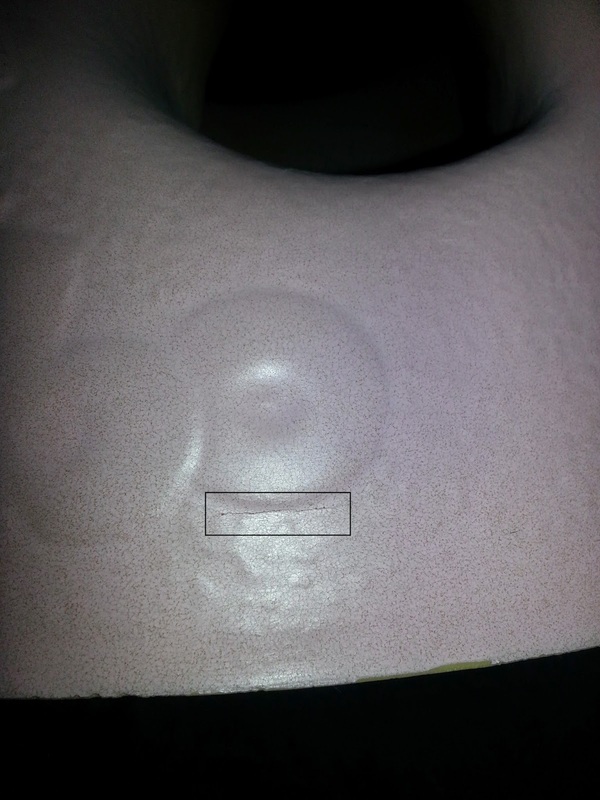 The integral outer skin of the material is durable and easy to clean. The Bumbo Baby Seat is versatile and can be used safely and conveniently anywhere on any level surface, and is definitely the extra set of hands you have always been looking for?- the perfect gift for that special occasion. 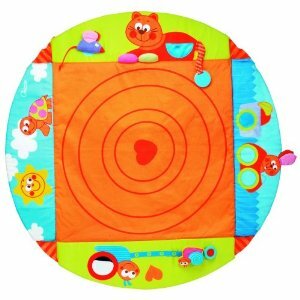 Soft Playmat Nursery Toy Turns into a comfy Playnest.Each Side has contrasting colours and different materials. Also includes cat with teething ring tail, snail with a bell and mouse that can be attached or detached. 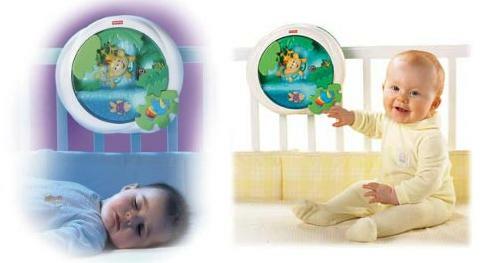 Soothe baby to sleep with the sights and sounds of a mesmerizing aquarium, right in the comfort of the crib. Swimming fish, gentle bubbles and softly glowing lights join with calming music and serene aquatic sounds (ocean waves, falling raindrops, babbling brook) to ease baby into slumber. And when morning comes, baby can enjoy quiet play with friendly characters. The starfish spins when baby presses a lever; smiling clam opens up when roller ball is batted. 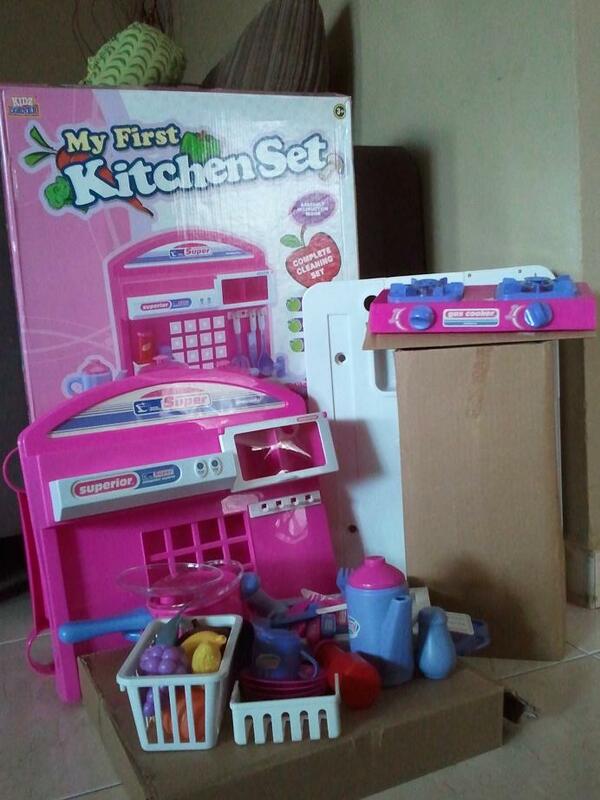 Baby can start motion, lights and sounds by pressing the shell button.3 Settings1. Music, lights, bubbles & swimming fish 2. Music & lights 3. Music only-3 soothing songs play for up to 10 minutes.It hooks easily on the side of the crib to help sooth baby to sleep. 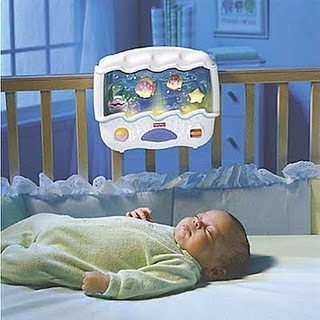 Your child can watch the fish and fall asleep to the music when he/she gets sleepy. 4 size D batteries required (not included). This soother lets you bring the peaceful serenity of a rainforest right to baby’s crib! A glowing waterfall has mesmerizing motion to help lull baby to sleep. The waterfall cascades gently into a pool where there’s a playful, bobbling fish—and plenty of bubbles for baby to enjoy! A friendly monkey and frog play peek-a-boo in the leaves, ready to keep baby company. You can choose up to 18 minutes of classical music, lullabies, or rainforest sounds for baby, with or without the soother’s softly colored lights that pulse gently on and off. Includes a power/volume control. Soother requires 4 "C" (LR14) alkaline batteries (not included). 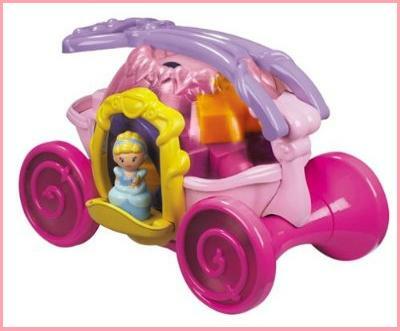 Now little girls can build magical moments with Cinderella! Cinderella sits in a lovely, highly decorated carriage with special feature blocks including turrets. The new Cinderella figurine becomes part of the scene as you build a castle. An adorable Cinderella's dolly that girls will love to take everywhere! Measurement: 7 x 9 x 12 inches. * Put-In, Take-Out play. * Features four fun sea creatures. * Creatures crinkle, rattle, jingle, and squeak. * Water-trapped sides of bowl with mini-sea creatures. 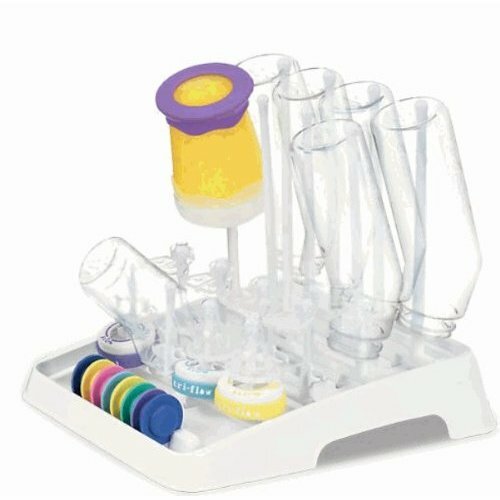 This Lamaze Play and Grow item comes complete with multiple textures and sounds to keep baby entertained. As wiith all Play and Grow items, Buzz comes complete with a Lamaze link, making it easy to take with. Measures approx. 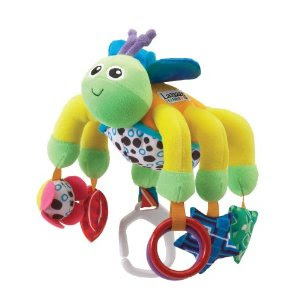 4.25" x 3.25" x 6.25"
Roly-poly, twist and turn makes it fun for baby to learn! As the tree wobbles, the ball spins round and round the base over the light-up buttons, playing music, sung songs and sound effects. Press the 3D bird character for extra fun phrases. 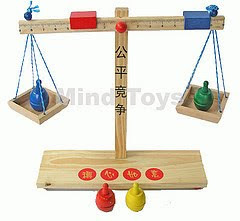 Teaches 123, colours and nature sound effects. 2 x AA batteries (not included). 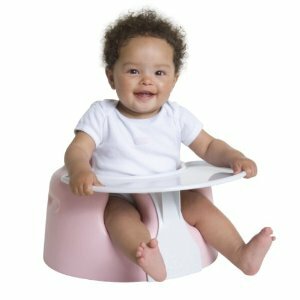 The Reclining 3-Stage Feeding Seat from First Years is the portable seat for newborns, infants and toddlers. 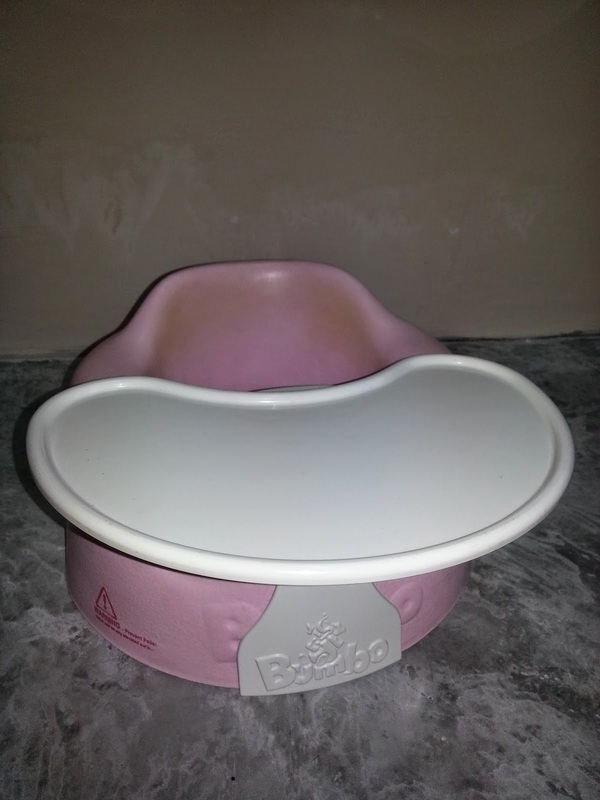 The First Years Reclining 3-Stage Feeding Seat is recommended for ages birth to 4 years. Its has 3 recline positions--just press and slide. 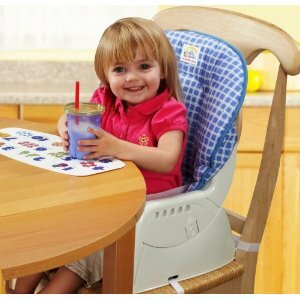 The seat with tray can replace a highchair. Full-size booster lets child sit at the family table. The tray is dishwasher safe. Its also features a removable backrest, high back for good support, fabric cushion that adds comfort and is machine washable, seat adjusts to two height positions, seat belt holds child in place, passive restraint helps prevent child from sliding. Two attaching straps hold seat securely to standard kitchen chairs and three tray positions with a one hand tray release.